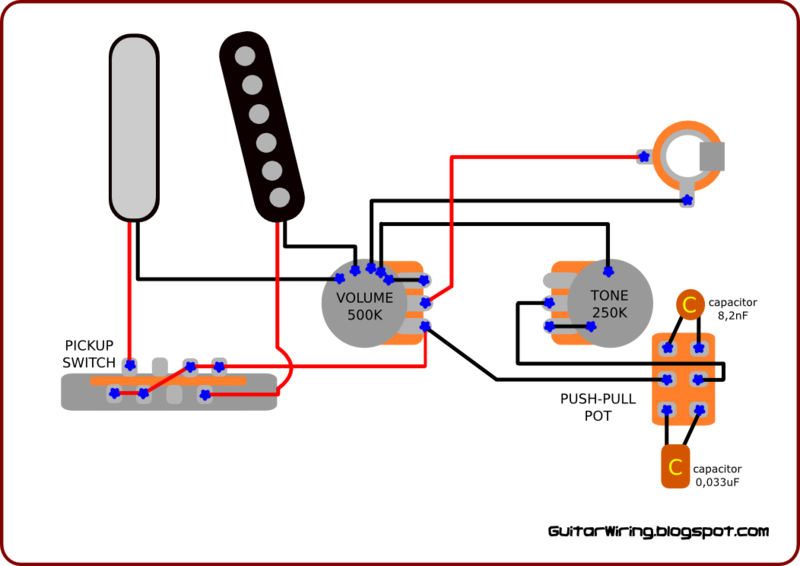 This is my new wiring design for Telecaster guitar fanciers. To make it, you need to change volume potentiometer from 250 to 500K, and put 250K push-pull pot for tone control. Also tone capacitors are not typical. As you can see, the push-pull pot is used for selecting tone capacitors. With the 0,033uF cap, the tone circuit will work similar (little less drastically) to typical Tele. You can also use the 0,047 cap in this place. The 8,2nF cap will by useful when you will like to make the tone just only a little bit warmer, smoother. With this wiring, your guitar will be a little brighter sounding than standard Tele, so tone control with selected the 8,2nF cap will be also useful to reach more "vintage" sound.